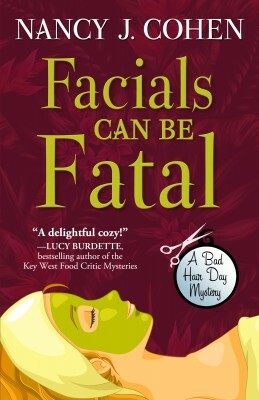 Details at the end of this post on how to enter to win an ARC copy of Facials Can Be Fatal. We also have a link to order it from Amazon, and from an indie bookstore where a portion goes to help support KRL. If Cut ‘N Dye hair salon owner Marla Vail was hoping for a quiet holiday season, she’s in for a disappointment. Instead, it’s going to be a Hanukkah and Christmas season of murder, secrets, a hidden treasure, and family expectations. It begins with shrieks from the adjoining spa aesthetician Rosana Hernandez alerting Marla of the death of client Valerie Weston. Her allergy to latex has proven to be fatal, apparently due to a latex-laced facial mask. It’s not the first time Marla has had an encounter with death in her salon, nor is the implication that it may not have been an accident. Val Weston was a major donor to the Friends of Old Florida, a historic preservation society that annually hosts a lavish holiday fundraising ball. This year Marla’s salon is styling the hair of the models in its featured fashion show, and the publicity will benefit Cut ‘N Dye immeasurably. A successful show should also counter any notoriety from Val’s untimely death, which Marla doesn’t need now that she is in contention for a new job. So it’s fortuitous that Marla’s duties behind the runway grant her access to those closest to Val, whose demise may have been caused by that devotion to her causes. This thirteenth book in the Bad Hair Day Mystery fully exploits Marla’s skills as both as an amateur detective and as a hair stylist. She deftly maneuvers through organized chaos of a fashion show, but it is of course Marla’s ability to invite confidences that make her such an asset to the police investigation. What proves to be far more challenging are the continual insinuations and suggestions that Marla should start focusing on having a baby as soon as possible. It has been a struggle for Marla to overcome the guilt of a tragedy that plagued her for decades, so Marla is doing all she can to avoid the topic. Focusing on the investigation proves to be far preferable, especially considering that her own best friend may be hiding a crisis. Longtime fans will feel fully invested in following Marla’s personal development, while mystery lovers will be surprised by the increasingly complex plot and numerous villains. The fast pace will have readers swiftly turning the pages of this compelling holiday mystery, and its auspicious conclusion leaves them anxiously hoping for more. 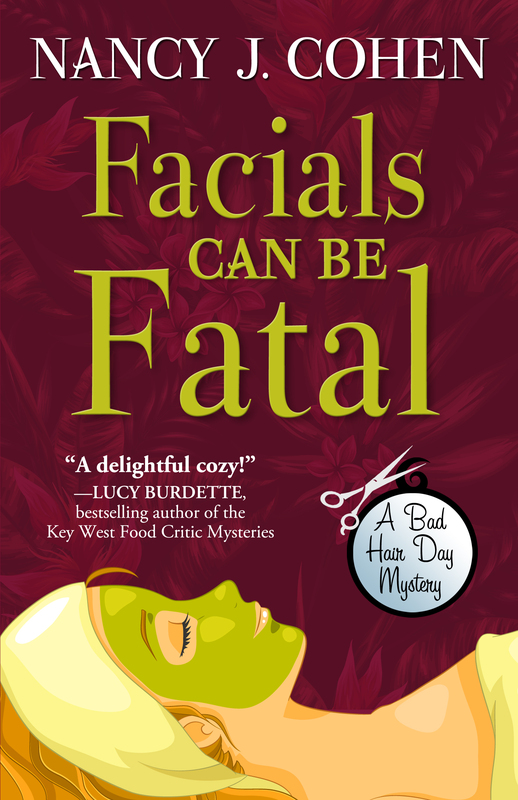 To enter to win and ARC copy of Facials Can Be Fatal, simply email KRL at krlcontests@gmail[dot]com by replacing the [dot] with a period, and with the subject line “facials,” or comment on this article. A winner will be chosen March 11, 2017. U.S. residents only. If entering via email please include your mailing address, and if via comment please include your email address. Can’t hardly call it fun when murder is involved but should be a good read! I’d still call it fun, Valerie, especially since you share the name of my victim! Thank you for this thorough and excellent review! Congrats on the excellent reviews your novel is receiving, Nancy. Wishing you continued success. Please add the book to your TBR list! Sounds like a good read – thanks for offer! I hope you’ll check out the book after the giveaway is over. Sounds like a good time to jump into this series! Thanks! You can jump into any of the books at any time and then can go back to the beginning if you like them. Great revuew. You got me at the latex allergy. Would love to read this. Thankyou for the opportunity! This book has history and mystery and fun facts about the global hair trade. I hope you’ll check it out! Ms Cohen writes such lovely books. I look forward to this one. I hope you’ll put this title on your Wish List. Good luck in the prize drawing, Jess. I hope it’s at the top of your must read list, Sheila! I would love to read this print book I just love Nancy and the way she writes is so funny. Her books are so good and would be delighted to read and post a few reviews on goodreads and amazon! Thank you for this write up and offer. Thank you, Peggy, for your kind remarks. By all means, do post reviews of my books on Amazon and Goodreads. I’d be much appreciative. Good luck in the prize drawing. I love this series of Nancy Cohen’s! Such an amazing author! I have not read this one yet, but I plan to! Thank you for the giveaway opportunity! Thank you for your kind words, Tara. Good to see you here!